The Poor Knights Islands are located 22 kms off Northlands east coast. Needless to say you will need a boat or a good charter operator to get you there. The good news is there are plenty of these. The easiest place to leave from is Tutukaka about 1.5 hours from Kerikeri or 30 minutes from Whangarei. The Poor Knights has been uninhabited since 1820, and a marine reserve since 1981. It is abundant with marine life often not seen elsewhere in NZ. The fish are everywhere you look and you cannot help but be in ore of your surroundings above or below the water. Don’t worry if you are not a diver as there is still plenty to do with Kayaking, Snorkelling, Swimming, Paddle boarding, Sightseeing, or just watching the fun as you relax on your day out. If you are a diver you are in for a treat. 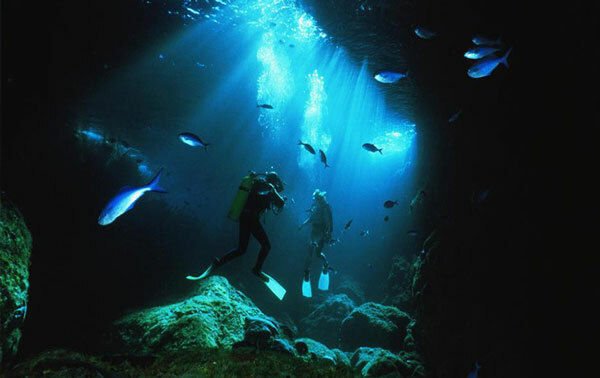 Jacques Cousteau rated the Poor Knights as one of the top ten dive spots in the world. With warm currents and no rivers to add sediment the visibility is amazing. Warm currents and being close to the continental shelf provide nutrient rich waters for all sorts of marine and fish life. If you heading to the north and have a thirst for adventure then the Poor Knights might be just what you are looking for. From Kerikeri, head south on State Highway 10 (the main road south). Turn left onto State Highway 1 at Pakaraka. (look for the signs saying Kawakawa/ Whangarei). After about 45 minutes turn left onto Salesyard Road. (Not to long after the little settlement of Hikurangi). Continue straight onto Vinegar Hill Road for about 5kms. Turn left onto Kiripaka Road, this road turns into Ngunguru Road, which then becomes Matapouri Road which takes you to Tutukaka. These three roads are about 23 kms in total.